The first Equinox Hotel is set to open in New York's Hudson Yards. The first Equinox Hotel is set to open in June in Hudson Yards, a neighborhood on the West Side of Midtown. In addition, the hotel has launched its online booking platform for room reservations. In line with a global vision for the brand, future Equinox Hotels are now confirmed for key international cities including Los Angeles, Seattle, Chicago, Houston and Santa Clara, CA, with several other sites under development. 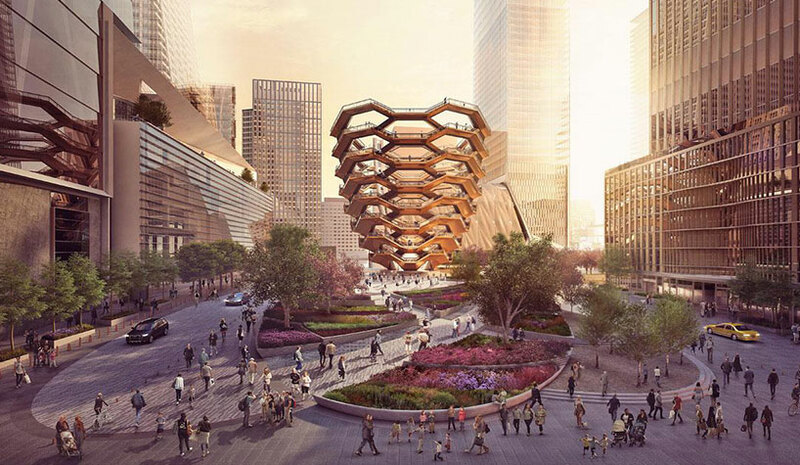 Poised to be the new epicenter of culture, arts and culinary for high performers across the globe, Hudson Yards will be anchored by Equinox Hotels as a destination for visitors and locals alike. With interior spaces by David Rockwell/Rockwell Group, exterior spaces by Ken Smith Workshop and Rockwell Group, and building design by David Childs/SOM, the property, with its arrival experience set in a private plaza at 35 Hudson Yards, will have 212 rooms, including 48 suites, as well as a Joyce Wang-designed Equinox Fitness Club and Spa. Amenities will include a 60,000-sq.-ft. Equinox Fitness Club, as well as E by Equinox, the brand’s most personalized portfolio offering, featuring an elevated approach to holistic health with emphasis on a bespoke hospitality experience for each member. Hotel guests, who become Equinox Fitness Clubs members for the duration of their stay, have access to a comprehensive Equinox Hudson Yards experience including signature group fitness classes, private Pilates, personal training services, a performance-driven spa, a 25-yard indoor salt water pool, hot & cold plunge pools, an outdoor leisure pool and terrace with culinary concept from renowned restaurateur, Stephen Starr, as well as a SoulCycle on the ground floor. Located on New York Ave. at the gateway of the high-end, mixed-use CityCenterDC, and developed by international real estate firm Hines and investor Qatari Diar, The Conrad Washington, DC has opened. The 360-room, 10-floor hotel designed by Pritzker Prize Laureates Herzog & de Meuron has 30,000 sq. ft. of luxury retail space on its ground floor and 32,000 sq. ft. of purpose-built meeting space, all above ground level. Rottet Studio designed the interiors as a restrained, minimalist expression of purity of thought and design to complement the carefully conceived building, according to the firm. The property’s signature restaurant, Estuary, offers an elevated farm-to-table dining experience serving seafood from the Chesapeake Bay. Oxford Hotels & Resorts LLC, the hotel management affiliate of Oxford Capital Group LLC, has opened the Hotel Essex on Michigan Ave. adjacent to Grant Park in Chicago. Formerly The Essex Inn, the landmark property underwent a multimillion-dollar transformation. Oxford worked closely with its joint venture partners at Quadrum Global to implement the strategic repositioning of the hotel, which closed in summer 2018 for renovations. Hotel Essex’s comprehensive redevelopment included the preservation and restoration of the building’s glass and steel structure and rooftop Essex Inn sign, the replacement of all the major building systems, and the transformation of all guestrooms, public spaces and interiors, bringing the property’s original mid-century modern aesthetic into the 21st century. Working closely with the development team, The Gettys Group led the hotel’s interior design, drawing on the building’s roots in the 1960s during the midst of the mid-century modern design movement. The AC Hotel Los Angeles South Bay, from design-led European lifestyle hotel brand AC Hotels by Marriott, is slated to open its doors to guests in a few short months. Located at 2130 East Maple Ave. in the burgeoning South Bay region of Los Angeles County and minutes from Los Angeles International Airport (LAX), the 180-room, new-build hotel will be home to a rooftop restaurant and bar with aerial views. It is being developed and managed by El Segundo-based Welcome Group Inc. Built by AXIS/GFA Architecture + Design, AC Hotel Los Angeles South Bay is part of the hotel and office project at Elevon Campus. Design Force is behind the hotel’s interior look and feel, which, similar to the hotel’s exterior, is locally inspired.